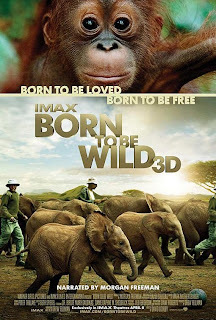 Starting April 8, you will become inspired by the remarkable bond between orphaned orangutans and elephants and their human caregivers in Born to Be Wild 3D. Narrated by Academy-Award® winner Morgan Freeman, this exquisite film highlights the heartwarming bond between orphaned animals and their human foster mothers. Let the Aquarium’s Simons IMAX Theatre transport you to the lush rainforests of Borneo to meet world-renowned primatologist Dr. Birute Galdikas, and across the rugged Kenyan savannah with celebrated elephant authority Dame Daphne Sheldrick, as they and their team rescue, rehabilitate and return these incredible animals back to the wild. Order your tickets now for the world premier at the New England Aquarium on April 8. Win tickets on facebook and twitter! Your chance to win tickets to Born to Be Wild 3D is coming up at noon on Friday, April 8. Connect with the Aquarium on facebook and twitter, and then watch those pages for a question about animal rescue. Reply with an answer as soon as you can and we'll choose our favorite answers to win a pair of IMAX tickets.